The purpose of this project is to investigate the spectral properties of turbulence in the magnetosheath of Saturn, using in-situ magnetic field measurements from the Cassini spacecraft. According to models of incompressible, turbulent fluids, the energy spectrum in the inertial range scales as the frequency to the power of -5/3, which has been observed in the near-Earth Solar wind but not in the Terrestrial magnetosheath unless close to the magnetopause. 120 time intervals for when Cassini is inside the magnetosheath are identified -- 40 in each category of behind quasi-perpendicular bow shocks, behind quasi-parallel bow shocks, and inside the middle of the magnetosheath. The power spectral density is thereafter calculated for each interval, with logarithmic regressions performed at the MHD and sub-ion scales separated by the ion gyrofrequency. The results seem to indicate similar behaviour as in the magnetosheath of Earth, without significant difference between quasi-perpendicular and quasi-parallel cases except somewhat steeper exponents at the MHD scale for the former. 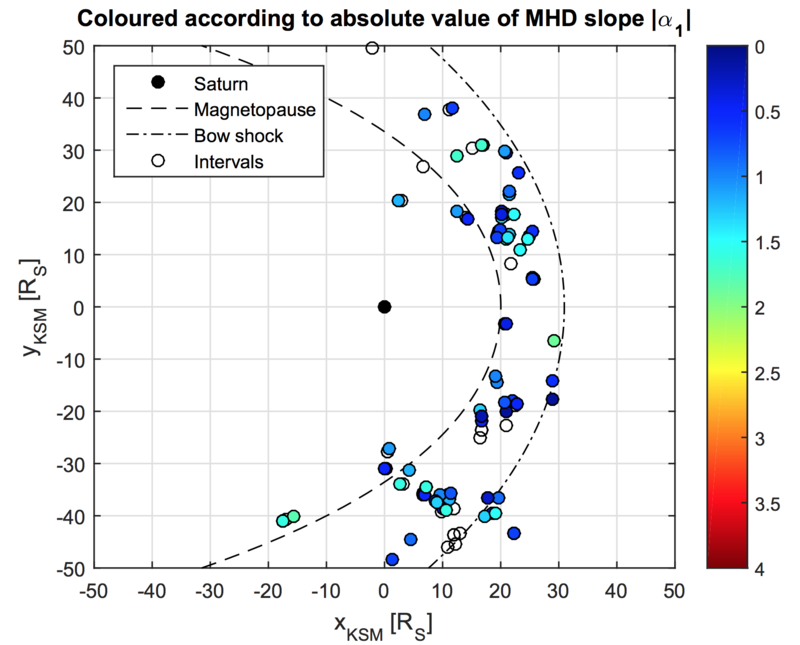 These observations confirm the role of the bow shock in destroying the fully developed turbulence of the Solar wind, thus explaining the absence of the inertial range. Map of spectral indices found in Saturn's magnetosheath.